It has been a few weeks since I got this blurry photo sent to me from school. My little guy attends preschool in the morning at the local elementary school and then rides a bus after preschool lets out to his other school. (Don't worry, he is strapped into a harness seat, and there is also a teacher who rides the bus too). The first week was really rough. He cried the entire four minute drive from school to school. From his daily reports, I know he has warmed up to the ride and has made friends with another little preschooler who rides the bus too. 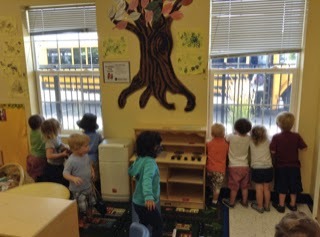 What is so funny about the bus ride, is when the bus drops him off after preschool, his other class is WAITING, watching, and lined up to see him get off. He is a mini celebrity riding that big yellow school bus. I hope he always has a classroom of friends that are excited for him join in their play.